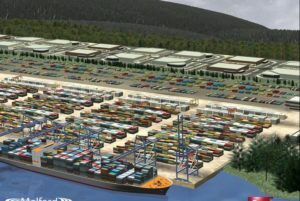 Melford Atlantic Gateway, a greenfield deep-water container terminal being developed in Nova Scotia on the Canadian East Coast, has awarded contracts for detailed engineering design and for clearing the site for the proposed development, thus marking another step forward of the project, Cape Breton Post informs. Attending the annual Port Days conference in Sydney (Canada) this week, Richie Mann, Vice President of Marketing at Melford International Terminal Inc. said in an interview that the engineering contract was awarded to Colorado-based consulting firm BergerABAM. And Port Hawkesbury Paper was contracted to clear the land plot of 700 acres for the future construction of the container terminal and logistics park. The Melford site is privately owned, totalling 267 hectares 660 acres on the southeast mainland shore of the Strait of Canso in Guysborough County, Nova Scotia, in the vicinity of Port Hawkesbury. The naturally deep (18m) ice-free harbor already hosts multiple liquid and dry bulk marine terminals. The work of the proposed terminal began a decade ago. The CAD 450 mln (apprx. USD 350 mln) project of Melford Atlantic Gateway involves a construction of a private container terminal capable of handling largest container vessels with an emphasis on direct vessel-to-rail transfer and a logistics park. In July 2016, SSA Marine, Melford International Terminal Inc. and Cyrus Capital Partners announced their collaboration and joint investment in the Melford Atlantic Gateway and said they would proceed to the next stage of attempting to lure shipping lines. Late last year Melford issued a request for qualifications for firms to complete the detailed professional engineering work for the project. The request documentation notes that it is envisioned that the container terminal will include about 69 hectares with a 1,095m berth, on-dock intermodal rail yard, container handling equipment, customs and cargo screening equipment, site security, utilities, truck gate, maintenance facility and an administration building. The Canadian East Coast, which has been a stable market for the last 50 years with Montreal and Halifax largely dominating the trade, has recently started experiencing a boom of port projects. Last December, Quebec Port Authority unveiled plans to build a container terminal as part of the Beauport 2020 expansion project. The Port of Halifax is examining the possibilities to relocate or create a new container terminal across to the Dartmouth side of the harbour. In December 2016, we wrote about Novaporte, a new container terminal proposed in the Port of Sydney, with Sydney Harbour Investment Partners marketing the proposal and with Ports America, the largest terminal operator and stevedore in the United States, nominated as the future terminal’s operator.